The Governor of New Mexico signed a bill outlawing cockfights. Cockfighting was a big part of our decision to move there! I am joking, of course, and have no idea why I find this piece of news amusing as killing animals for fun is not at all amusing. Louisiana is now the only state where cockfighting remains legal. I was actually looking for news about the statewide smoking ban in New Mexico. The bill passed through the Legislature and Governor Bill Richardson signed the bill today. I'm curious to see the response as I am sure folks are going to be up in arms about it. Will and I lived (and smoked) in New York City when that ban went into effect and it pissed a lot of people off. Ultimately we found it to be less of an inconvenience than expected. In fact, at times it opened up another social realm outside of the bar in the smoking area. We haven't smoked for years, (though a night Gooski's is pretty close to smoking a pack of cigarettes) so I have no complaints about a smoking ban in NM. And don't let it stop you, my dear smoking friends, from coming to visit. Remember, the sun always shines in the southwest so smoking outside won't be so bad. Speaking of vices, I drank a wee bit too much vino last night and had a rock star photo shoot all by myself. It was rather silly, actually, but I suppose with all the anxiety I've had lately, silly is good. The vino also made me super nostalgic and I dug up some old photos that my friend Birdy took of me on a road trip to Montana. Such long hair! And so young! I don't think I look particularly old now, but then I see an old photo and realize that I am not quite so fresh-faced anymore. 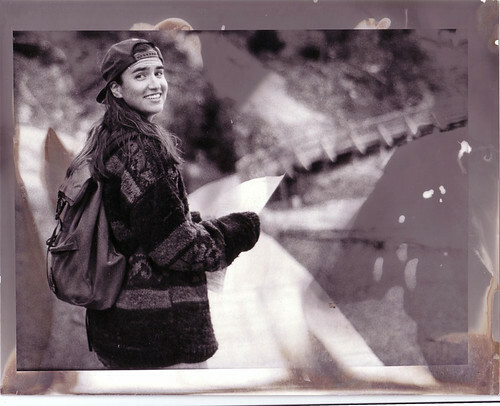 I was 22 in this picture (and I believe we were in Yellowstone). Shortly after this trip, I cut off all my hair. It's never been that long since. Anyway, I woke up at three o'clock this morning and couldn't get back to sleep so between the vino and lack of sleep, I am feeling rather loopy today. Just itching to get out of the office and into the sunshine! !